With a stratospheric price-tag and more pulling power than any production car on the market, the Bentley Brooklands represents motoring aristocracy. It rates as one of the most desirable and expensive coupes money can buy, unfortunately my money wont stretch that far, I can just about afford to lease a Nissan Pixo. The Bentley Brooklands has road presence in spades with large dimensions and a swish exterior that never fails to attract attention wherever it goes. It captures hearts with a sweeping roofline and big wheels that touch base with the great Bentleys of the past. That’s not to say that the Bentley Brooklands isn’t bang up to date. It is very much the 21st century luxury car with a host of expensive toys, striking tailpipes at the back and a jewel-style filler cap. There is a bewildering array of top notch interior options to choose from in a cabin that is quite simply stunning. The sense of occasion as you step into the car is just the start of the Bentley experience. To fire up the monstrous twin turbocharged engine is to experience a true sense of awe. The 6.75-litre V8 power plant pumps out 530bhp and a massive 1,050Nm of torque. But these figures tell only part of the tale as the amazing bellow of the engine and terrific turbos add to the drama. Put the pedal to the metal and the nose rises as a wave of torque is unleashed and the Bentley Brooklands surges forward. Obviously a car that is longer than a Ronnie Corbett joke takes a bit of getting used to – but once the sheer size of the thing has been assimilated then you will simply want to drive it all the time. The cabin is a wonderful place to spend a journey. According to the manufacturer the Bentley Brooklands has the most spacious rear cabin of any coupe on the market thanks to a pair of electrically adjustable seats. It also has a light, airy, luxurious atmosphere that just oozes class. The Bentley Brooklands has a remarkably stiff chassis so ride comfort is top notch while the handling is phenomenal in a car this big. Levels of grip are excellent but the car’s weight catches up with it if you start to throw it into corners. However, it’s almost obscene to even think of abusing a Bentley Brooklands in this manner and if the need is for fast cornering then buy a Ferrari. There is a downside to the Bentley Brooklands and that is unsurprisingly the amount it costs to run. Both fuel consumption and carbon dioxide emissions are predictable dire, the only respite for rainforests being that relatively few Brooklands are being built and sold. But let’s face it, if you’ve got the loot to buy one, the cost of the fuel is going to be small potatoes indeed. Think Pemier League footballer, media mogul, or captain of industry and you’ll be in the ball park for the target market for the Bentley Brooklands. The £25,000 deposit needed to secure an order is just the start. Even paying the balance on the £230,000 price-tag isn’t the end of it as the amazing carbon ceramic brake discs – vital to stopping such a huge car with 0-60mph time of just five seconds – cost an extra £19,650. There’s also a special set of wheels for a couple of grand and a ‘Flying B’ mascot that for a shade over £2,000 ducks out of danger before reappearing when its owner does. The cabin is decked out with high quality wood, leather and shiny metal inserts. There’s also a knurled alloy shift lever for the six-speed automatic transmission that dominates the glorious centre console. The array of luxurious interior options available with the Bentley Brooklands is truly astounding with a huge number of colour and trim combinations possible. The idea is to make each Bentley Brooklands unique for every owner so no two cars will be the same. As a general rule a Booklands buyer spends approximately £30,000 personalising the car. A car this desirable obviously is a tempting target for professional gangs stealing to order and the myriad of measures protecting the Bentely Brooklands reflects this. Safety in a car this powerful is also a priority for Bentley with a raft of equipment designed to keep occupants safe in the event of an accident as well as hi-tech electronic aids to prevent it happening in the first place. 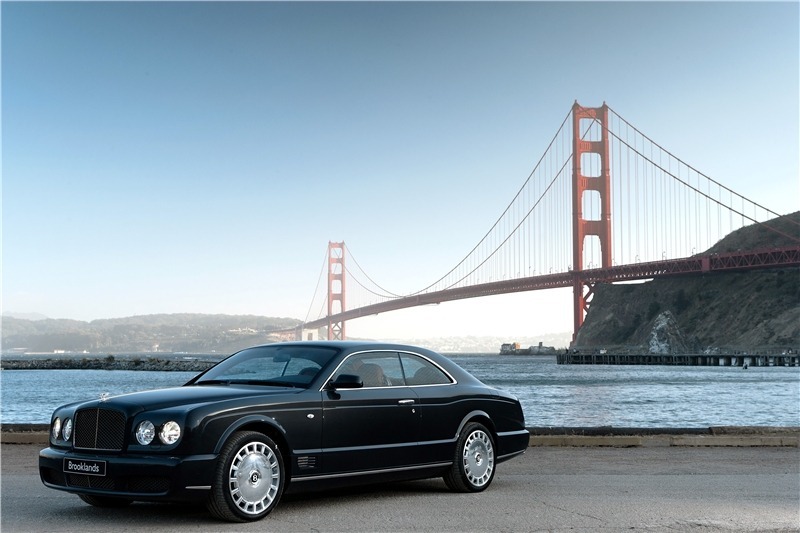 It’s perhaps easier to say what the Bentley Brooklands doesn’t have. Jacuzzis, saunas and squash courts are a little thin on the ground, but every other car luxury is included – and if you think of any that are not I’m sure Bentley will move mountains in an attempt to include it.